We're testing the Bathroom (Marine) candle by LAFCO New York tonight. It looks absolutely gorgeous on our mantel in the hand-blown glass container (a nice bonus). The Lafco Bathroom candle is huge! It weighs over a pound with 16oz of wax, over 90 hour burn time and 4"x4" hand blown glass vessel! It makes quite an impact. 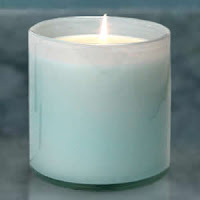 The Lafco Marine candle has a beautiful ocean/summer fragrance with a hint of cucumber. It makes a great background scent - perfect for entertaining. We can smell it but it's not overwhelming in our average size family room. It's burning very cleanly and steady (no flickering, soot or smoke) and it's an easy burning candle. On a scale of 0 to 5 we give it a 2.5 for scent and 4.5 for burning (only because we haven't see the wax melt all the way to the side yet after 2 hours of burning. We're not sure if it will not tunnel or not yet.) We definitely recommend this Lafco Bathroom Marine candle. It also makes a nice hostess gift! Update: After 2-3 hours of burning, we needed to center the wick on the Lafco Bathroom candle as it was creating a wax pool off to one side. Centering the wick centered the wax pool after a while but we were never able to get the wax to burn all the way to the sides, even after 4 hours of burning. (We got to about 1/2" of the edge - not bad.) I would recommend burning for 4-6 hours on the initial burn and at least 3-4 hours on subsequent burns to avoid tunneling. Since this candle is so large, so wide and slightly pricey, you want to be sure to take advantage of the 90+ hour burn time. We also needed to trim the wick after 2-3 hours to keep the flame tight and steady. A large flickery flame can create soot and smoke and burn the wax too quickly lessening the burn time. After trimming the wick the flame burned beautifully again. The vessel is translucent so you can see the flame burning. The soft blue hue is stunning and each hand-blown glass vessel has it's own unique look. Lafco candles are very lovely! The Marine Candle fragrance intensified after 2-3 hours and I would increase the scent rating to 3 or 3.5. I still give it a 4.5 for burning. Even though we had to trim the wick after 2-3 hours, it burned easily but never liquefied across the top. Overall, the Lafco Bathroom Marine candle is a very easy burning candle and incredibly beautiful! This is the first time we've ever tried a Lafco candle and we're very impressed! We highly recommend the Lafco House & Home candles.